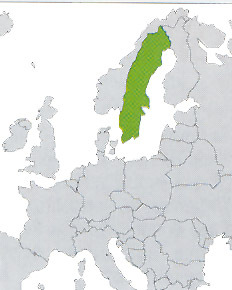 It occupies all the eastern part of the Scandinavian peninsula, which overlooks toward Botnia Gulf with low and mostly linear coasts, while to south-west Sweden is wetted from the Kattegat, which insinuates itself toward earth in deep inlets like the Norwegian fiords. The nation is wide, poorly inhabited (20 inhab/ Kmq), extremely organized, civilian, rich, with green beautiful landscapes, splendid lakes and comfortable town. The decrease of the births is clear with a natural strong decrease of the population, however there is a solid immigration, above all from the Balkan area and the European east, but also from the Middle East. Wide part of the territory (about 8%) is occupied from very beautiful big lakes, among which the most famous ones are the Vanern, the Vattern, on whose banks the wonderful small town of Vadstena rises and the Malaren with the beautiful center of Mariefred and with artificial channels which attach it from the Baltic Sea to Stockholm.